Foam roller exercises are most important to help you become more aware of your body. The muscles of the calves and shins represent stepping and moving forward into the future. The perfect place to start to learn about self-myofascial release, which is what foam rolling does, is my index article on Foam Rolling. I explain more deeply, how you can benefit by understanding the body-mind connection through the practice of foam roller exercises. By attending to an area of your body, you send energy there for healing. Self-myofascial release is a technique that athletes use to keep over-used muscles supple, long and free of knots or hot spots. However, due to tension held in our bodies, the average person also develops stress knots, or "congestion" as I refer to it. Learning to do foam roller exercises is a wonderful way to stretch, elongate and heal your muscles. Self-myofascial release is a form of self-treatment and self-physical therapy. You can avoid expensive massages and physical therapy if you know how to foam roll! But the practice of doing foam roller exercises is more than physical. As many body workers know, there are "issues in the tissues," so when you practice this activity, the release of muscular tension may also release unexpected emotions! I have had many people write to me and tell me this is so! I have experienced it myself. The key to the body-mind release is performing the foam roller exercises in a meditative fashion. Really focusing on the area that is sore and sending your breath and your awareness there for healing. Emotions do affect our body, so becoming body-aware is always a healing process! Strong emotions that have not been dealt with, are stored in our bodies. Where this energy and congestion is stored is hidden in metaphors of the body. It is through performing foam roller exercises that we find our congested areas, become aware of it, and can send our energy there to relieve it. If you are looking for a foam roller, I recommend the premium, high density, and textured models for your foam roller exercises. These are the best type because they last the longest, and the textured surface will provide the most traction on your yoga sticky mat. This is important, because you tend to slide around on the roller and the mat. Look around online, because the better, premium models are not readily available at your local stores. I also recommend the full size, 36 x 6 in round, since it is the most versatile and the one I use in all my foam roller exercise pages. The main function of the gastrocnemius muscles, on the back of the calf is to lift the heel up. This movement is called plantar flexion or the movement that points the toes. The gastrocnemius, when viewed from the surface of the calf is the nicely rounded muscle that appears as two heads. It is the muscle of the lower leg that is most greatly admired. This muscle is important because it attaches to the Achilles tendon on the back of the ankle. Working in conjunction with the gastrocnemius muscles, are the muscles on the front of the calf, called the anterior tibialis muscles. The tibialis muscles are what you know as the shins. The responsibility of the anterior tibialis muscles is to pull the toes up toward the shins. This movement is called dorsiflexion. When walking, running or jumping, both the gastrocnemius muscles and tibialis muscles are involved as the foot/ankle is flexed from one movement to another, up and down. These muscles are also involved with the stabilization of the ankle, to prevent side-to-side movements. One of the most common problems of the lower leg is shin splints. Shin splints can involve anywhere along the tibia, or shinbone. It is an overuse injury of the anterior tibialis muscles, when the muscle becomes inflamed, painful and perhaps swollen. Shin splints can become so severe that the actual muscle fibers of the anterior tibialis muscle are torn off the shinbone. If this happens because you did not listen to your body window, you may be in serious trouble unless you decide to change your ways. Achilles tendonitis is another common problem of the back of the ankle. Due to over-use or misuse, the tendon becomes inflamed, painful and swollen. The Achilles tendon is a well-known tendon because of the “Achilles heel” phenomenon from Greek mythology when Achilles was struck down at his only weak point – his heel. If greatly misused and/or over-used, the Achilles tendon can also be ruptured. Because the ankle is connected to the foot, keeping the muscles and tendons of the calves and ankles flexible and free of tension and tightness will prevent plantar fasciitis! Plantar fasciitis is a very painful condition of the fascial tendons on the bottom of the feet that when overused become inflamed, swollen and even torn, if the foot pain is ignored. Overusing the legs in any sport, especially running sports. New runners just starting out and unaccustomed to running, or past runners that start up quickly after a long time off from running. Suddenly running or sprinting much faster, as done with speed work, when unaccustomed to it or rapidly increasing your mileage or amount of activity before acclimation. Tight gastrocnemius muscles of the calves, and lack of stretching the calves and the Achilles tendon and the anterior tibialis muscles – all areas which are naturally weaker and smaller in mass than the larger muscles of the legs. Running uphill or adding stair climbing to your work-out. Improper running position or technique, weak anterior tibialis muscles that let the foot slap, over-pronation of the foot, and other foot or ankle problems. If you have only a slight strain or mild to moderate tightness in the gastrocnemius muscles, or shin muscles, then first try the RICE procedures: Rest, Ice, Compression and Elevation. To avoid re-injuring your muscles and/or tendons after an injury, please rest the injury and do not perform foam roller exercises until your pain subsides. The energy and emotions involved with the muscles of the leg, including the lower leg, involves the metaphor of moving forward in life, or it's opposite, the fear of moving forward. Fear of the future and lack of desire to move into the future and its changes is the major theme here. Again, from the opposite spectrum, it may involve too strong a desire to push toward the future as well. When you foam roll, you learn to uncover these emotional issues, by developing intuition on your foam roller. Since the lower leg muscles connects to the foot, foot issues, and stepping may be involved. ‘Nowhere to step,’ or ‘not knowing where to step,’ or ‘step it up,’ or ‘stepping out,’ or ‘side-stepping,’ may all be involved in your truth. It may also involve your own personal ‘Achilles heel,’ i.e. your weakness(es) that you haven’t owned. Lifting the heel means walking on your tip-toes, so maybe you are ‘tip-toeing around’ or ‘walking on eggs.’ Shin splints may be about ‘splintering’ or something ‘torn’ or ‘torn up’ in your life. Healing shin splints, Achilles tendonitis, plantar fasciitis and sore calves and feet all take enormous amounts of self-love and self-understanding. You need to spend a lot of time with these foam roller exercises, shin splint stretches and ankle and calf stretches, resting and babying your lower legs if you wish to heal. Since everything you do involves stepping it will be very hard to discipline yourself through rest and pampering to discover your body-mind-soul issues with your feet, ankles, shins or calves. The feet and ankles bear the burden of the load of your whole body, so listening to them is very important if you have problems with your lower legs. I knew a person who was so good at ignoring his body window that despite ankle pain, he kept up his power walking program. When the pain failed to subside, he finally went to get it checked out. What he found out was that he had been walking with stress fractures in his feet, for who knows how long! Now that is determination. Yet finding an activity that rested his ankles was difficult indeed. He now, truly had ‘nowhere to step.’ Was his body window speaking to him? Aquatics were the only answer, but he did not want to change his program and I never heard how he ended up. The power of the will is strong indeed and you need to be especially astute if you recognize that you are a driver and forceful user of your will. In the above example, I never did find out on what his body-mind-soul issue was centered, specifically. But I do know that it was about willfully forcing himself forward in life. If you are the type that keeps on pushing and running through shin splints and Achilles tendonitis, and other foot or ankle problems could you be running away from something? Does running represent a body-mind-soul issue for you? If your have stress fractures in your feet does this represent too much stress in your life that you are manifesting in your feet? There is a reason they call them stress fractures! When you are doing your foam roller exercises for your gastrocnemius muscles in your calves and your anterior tibialis muscles in your shins, meditate on what your body could be specifically saying to you through these sore areas. You can also roll the ankle area, if it doesn’t cause you pain. I step out with Love. My ankles are straight and strong! I walk/move through life with joy and ease. I tenderly step forward in my life and treat myself with respect. I move forward with kindness and ease. I release control and let God/the Universe guide me. I move carefully and slowly forward, trusting that all I need to know will be revealed to me. I flex my ankles with ease. I believe the future holds all good things for me. I have time for everything that has meaning for me in my life. I move to the rhythm of the Universe with my body as my guide. I love and trust myself to find my truth! As you practice the foam roller exercises I give for your gastrocnemius muscles and anterior tibialis muscles, and as you hold the shin and calf stretches, contemplate on what your sore areas may represent to you. Keep your sensory perception high and notice if you may be holding emotions that need to be released. Reflect on whether you may have issues of fear of something new in your life. Are you afraid of moving forward? Or are you doing the opposite and powering yourself forward too forcefully? Write your feelings down in a journal as you meditate on your calf muscles, your shins and your ankles. Often these feelings will come as you are doing the actual foam roller exercises themselves. Write down your truth and your affirmations that you have created and make them a part of your daily rituals. Remember that this is a personal process and my instructions are only meant to provide a guideline to get you started. However, it is very important to pay attention to your breathing. As you begin the foam roller exercises, you may find areas that are so sore that it will make you want to hold your breath as you roll and apply pressure. This is an automatic response to pain. In order for the muscle to release, you must learn to keep breathing deeply as you foam roll. If you find a painful area and notice that you are holding your breath, ease up on the pressure so you can breathe deeply again. It is the breathing deeply that signals to your body that you are in a relaxed state. It may take a few tries over a few days to learn this deep breathing while rolling, so that your muscle can release eventually. When you hold the pressure over the muscle as you breath deeply, eventually the muscle WILL release. With this release comes the emotional release as well. As you learn this releasing process, you will become addicted to it! This is the secret to doing foam roller exercises in an open and mindful way that heals your body, mind and soul! If at any time you have more severe pain in your calves, you may wish to seek the advice of the experts. For the anterior tibialis muscles, ‘kneel’ on the foam roller with your shins down on the roller, like in the yoga child’s pose. Position the foam roller just below the knee caps. Keep your arms extended out in front of you for more balance, and pull forward with your hands as you roll down the length of the shins, and to the ankles too if your intuition desires. Roll back up by pushing off with your hands. You may need to adjust your arm position or shin position on the roller to find a comfortable spot for you. Avoid rolling over the knee caps. If you'd like to increase the sensation of this exercise, cross over your leg at the ankles, as shown, and the one side will take more pressure. This cross over is not depicted in the video for the anterior tibialis rolling because it’s a little more difficult to do, requiring more balance. If this movement feels easy to you and want to go for more more pressure to your shins, go ahead and give it a try! With the crossover, you can also target a muscle called the peroneus muscle in the side of the lower leg. For the gastrocnemius muscles in the calves sit down on the floor with your legs extended out. Position your foam roller under the calves just below the knee. Place your arms slightly behind your buttocks. Push up with your arms to lift your hips just off the floor, as you also push out to roll the foam roller down your lower leg. You can roll over the ankle and Achilles tendon area as well if your intuition dictates. Again, you may wish to increase the sensation on one side, by crossing your legs at the ankle to foam roll each specific calf and ankle. Do both legs equally for balance. (Not pictured) You can roll more to the inside of the leg to target the medial head of the calf muscle or roll more to the outside of the leg to target the lateral head. To increase the pressure on the muscle and intensify the stretch, push deeper with your body weight into the foam roller. Be creative and roll where your intuition tells you to go. The video is just a starting point. 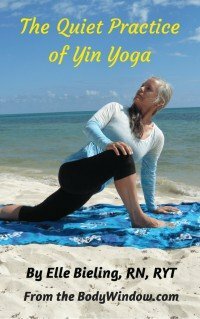 Follow up, if you like, with calf stretches by doing yoga stretches. The best calf stretch and Achilles tendon stretch is the Downward Dog. I also like the Seated Forward Bend, but instead of reaching for your feet, sit up straight and reach for your toes and pull them toward you for the calf stretch. The more you pull, the better the stretch for the Achilles tendon as well. You can do calf stretches when standing if you prefer, just lean toward a wall with your hands on the wall. Place one foot farther back than the other, straight out and about 4 feet from the wall. The other leg is bent and in front. Lean into the wall. The harder you lean, the deeper the calf stretch. You can also try keeping your feet together and lean into the wall. Your legs are about four feet from the wall again. 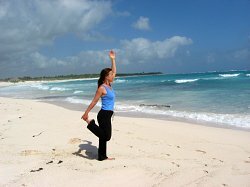 For shin stretches and shin splint stretches, any of the yoga stretches that enable you to point your toes would work. Just pull up harder on the toes. Yoga poses including the Modified Dancer's Pose and the Modified Pigeon Pose would work. Both of these poses are great quadriceps stretches too. With both of these poses, don’t bother to raise your arm. Just use it to balance as you really pull on your toes to feel the shin stretches. Because all of the joints, muscles and tendons of the leg are connected, over-all stretching of the legs will benefit ankles and calves. It is through Foam roller exercises and stretching that you create space in your body. This practice leads you to create space in your heart and mind as well! This is a wonderful metaphor to create space in your life. It is only when your body is open and relaxed, totally tension-free, that positive and healing energy can flow in! May you always strive to heal your life through self-discovery when you practice these foam roller exercises, calf stretches and shin stretches. May you discover the simple beauty of self-myofascial release as you journey forward in your quest for body-mind-soul healing!